BRYN MAWR, Pennsylvania — United for Libraries will present a webinar on working with Friends of the Library groups, “With Friends Like These,” at 2 p.m. Eastern time on Tuesday, April 25. Friends are wonderful assets to their libraries... unless they’re not! Sadly, some Friends groups fall into cliques, start demanding to determine how the money is spent, start believing that they “own” the money raised rather than understanding their role as “trustees” of the money, and even start wanting a say in the library’s governance and/or operations. 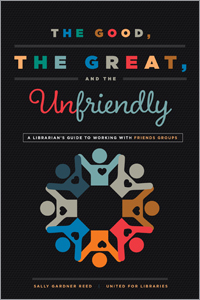 Based on her recently published book, “The Good, the Great, and the Unfriendly: A Librarian’s Guide to Working Effectively with Friends,” Sally Gardner Reed (executive director of United for Libraries) will discuss ways to work with Friends who go rogue, how to bring them back in line, and what to do when nothing works. Participants will be invited to send in questions (anonymously if preferred) ahead of the webinar so that personal cases can be addressed during the 30-minute question and answer period. The webinar will be archived so that access can be purchased in the future. Ways to work with Friends who go rogue. How to bring them back in line. What to do when nothing works. Sally Gardner Reed is the executive director of United for Libraries, formerly executive director of Friends of Libraries U.S.A. (FOLUSA). Prior to accepting this position in 2002, Sally spent nearly 20 years in library administration running small public libraries in New England and the Midwest, and most recently she was the director of the Norfolk (Va.) Public Library. Reed is the author of eight books on library management, advocacy, volunteers, and fundraising and numerous articles for professional library journals. She has presented programs and workshops to hundreds Friends of Library groups, boards of trustees, and librarian groups nationally and internationally. She is the 2000 recipient of ALA’s Herbert and Virginia White Award for promoting libraries and librarianship. The cost of the webinar is $75, $50 United for Libraries members. To register, visit http://www.ala.org/united/training/webinars/friends-like-these, call (800) 545-2433, ext. 5, or email registration@ala.org. Registration is limited for the live webinar. United for Libraries: The Association of Library Trustees, Advocates, Friends and Foundations, is a division of the American Library Association with approximately 4,000 personal and group members representing hundreds of thousands of library supporters. United for Libraries supports those who govern, promote, advocate, and fundraise for libraries, and brings together library trustees, advocates, friends, and foundations into a partnership that creates a powerful force for libraries in the 21st century. To join, please visit www.ala.org/united or call (800) 545-2433, ext. 2161.